Will Nokia 8 Be The King of Smartphone Industry? 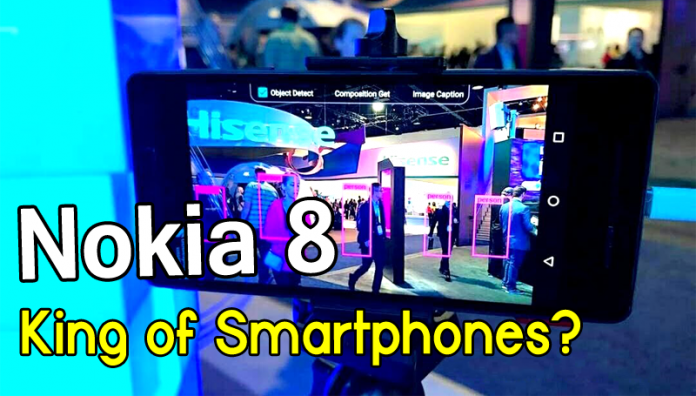 Home Smartphones Will Nokia 8 Be The King of Smartphone Industry? Nokia 6 the first Nokia Android smartphone is finally out of the cage and it making wave already. HMD Global has ridiculed Nokia 8 which could be the king of Smartphone industry. Will Nokia 8 Be The King of Smartphone in the Industry? 4,00,000 and still counting registration on JD.com for Nokia 6 which was just announced last week. It has made a huge hit. Apple is to launch iPhone 8 and Samsung to launch to Galaxy S8 too this year in the same way Nokia is expected to launch Nokia. The rumors is creating lots of spark in die hard fans. Nokia 8 will be a high-end smartphone is now compared with Galaxy S8 and iPhone 8. Nokia already kidded a press event for MWC where it may reveal some of it Products, and Nokia 8 is going to be one of them. According to GSM Arena Nokia 8 was spotted at CES 2017, and it will be available in two variants. Nokia 8 will feature 4GB RAM, Snapdragon 821 processor, and an unspecified camera. The another variant will feature 6GB Of RAM, Snapdragon 835 processor and will have internal memory of 64/128GB. Apart from this, the phone will even support microSD card which can be expanded up to 256GB. The screen size screen size for the device will stand at 5.7 inches, with a resolution of 2560×1440. Nokia 8 will feature 24MP rear camera along with the Carl Zeiss optics that will support OIS and Super EIS. While at the front, it will feature 12MP secondary camera along with dual speakers. So, by looking at the expected specifications of Nokia 8, it turned out that Nokia 8 is going to dominate the smartphone industry. What do you think about this? Share your views in the comment box below. Android One vs Android Go: What are they?